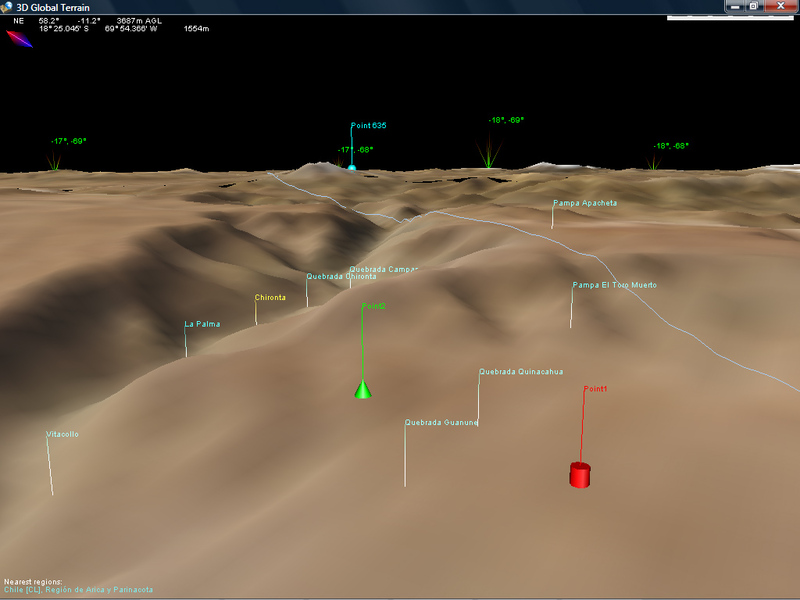 3D Global Terrain is the only OFF-LINE 3D platform that combines NASA imagery generated from Blue Marble project, elevation data from Shuttle Radar Topography Mission and more than 6.5 million of land markers with Cities and Points of Interest into a relatively small but powerful worldwide platform. 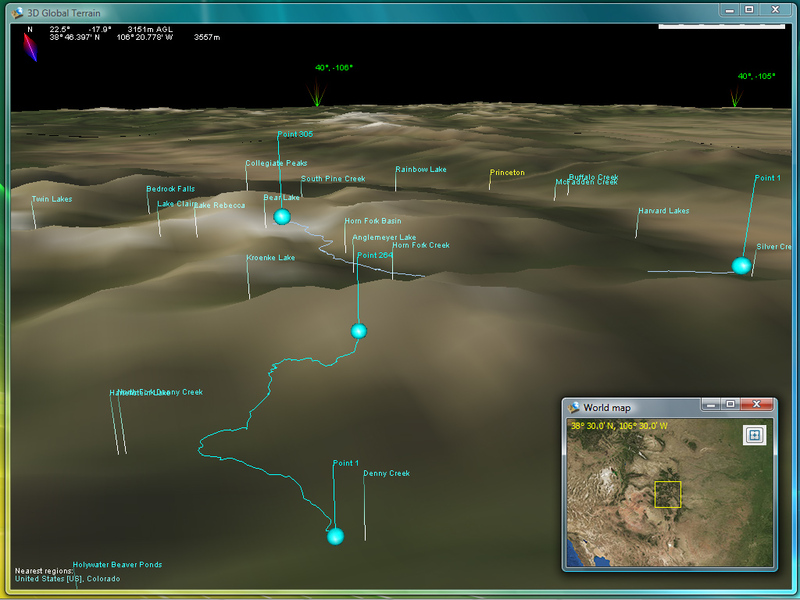 GTerrain will allow you to visit any place in the world, know the general topography, and load and display Waypoints, Routes and Tracks from many file formats. Topography and Satellite imagery: GTerrain has a full copy of the Blue Marble satellite imagery and the Shuttle Radar Topography Mission (SRTM) Data stored in an off-line database (local copy) allowing you to use GTerrain without Internet connection. Both Blue Marble and the SRTM have a fixed resolution of ~450mts per pixel, in order to maintain a relatively low hard-disk space requirement of ~3GB. This important feature will give you the possibility to use 3D Global Terrain in field applications (using it on a Notebook on the road). Place names: GTerrain has a full catalog of 2,411,161 countries, capitals, cities, towns, and even historical references and 4,252,852 of additional points of interest like mountains, valleys, lakes, rivers, structures, etc. 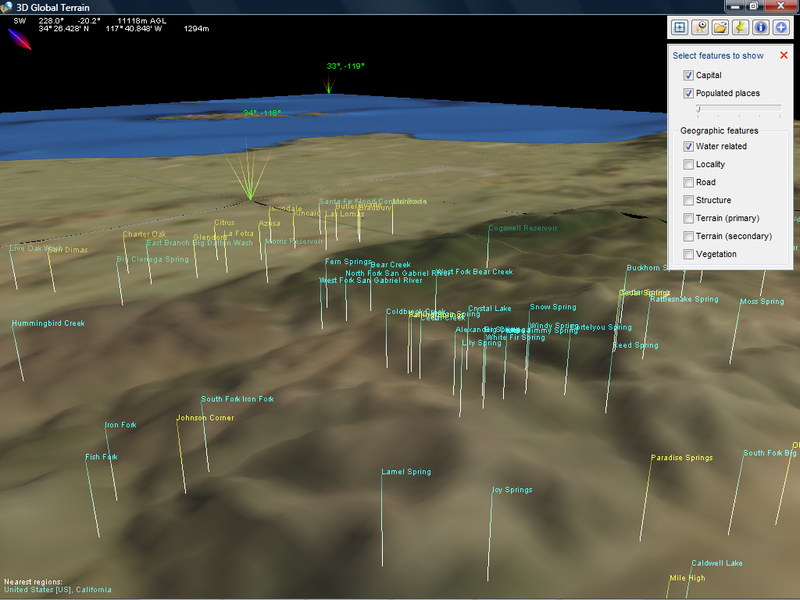 The names update dynamically, by increasing or decreasing in number according the user proximity and altitude. 3D Engine: GTerrain uses First Person Perspective (FPP), which renders the world from the visual perspective of the user, in a realistic way just as if he were really there. Particular focus was put into the ease of usability, all one needs to control GTerrain is a two button mouse and the arrow keys or just a Joystick. 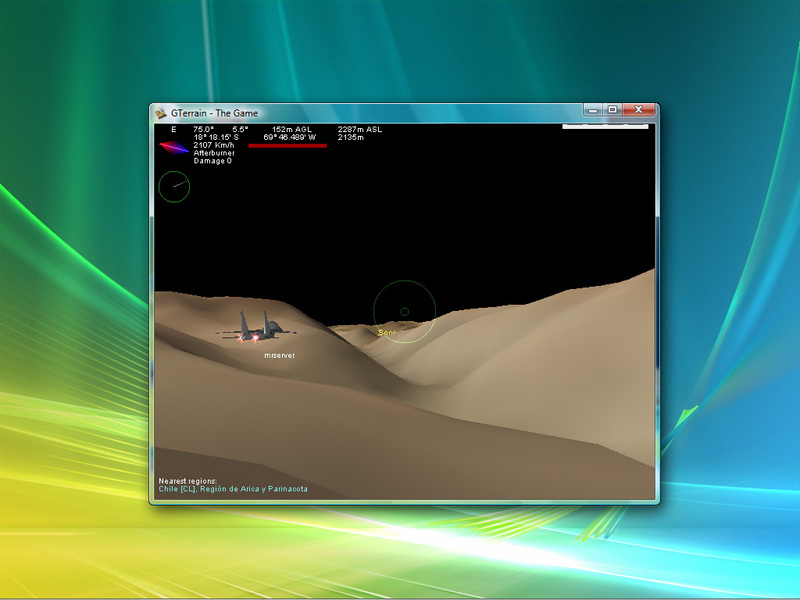 GTerrain was designed to run on recent PC hardware with 3D acceleration. Please refer to the download section for more information on system requirements. 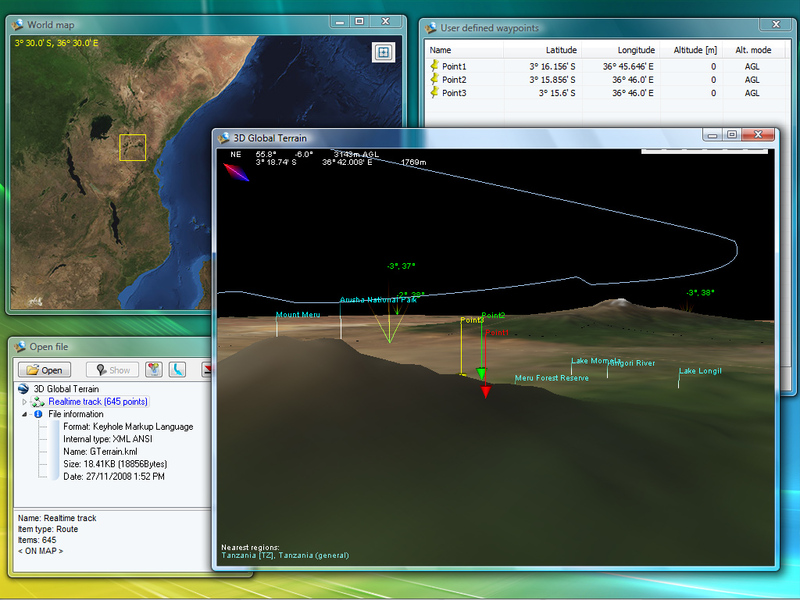 Visual Tools: GTerrain comes with a variety of visual guides that help the user's experience such as latitude and longitude markers, as well as extremely precise coordinate data, like geographic position, compass, heading and tilt indicator, altitude and ground elevation. 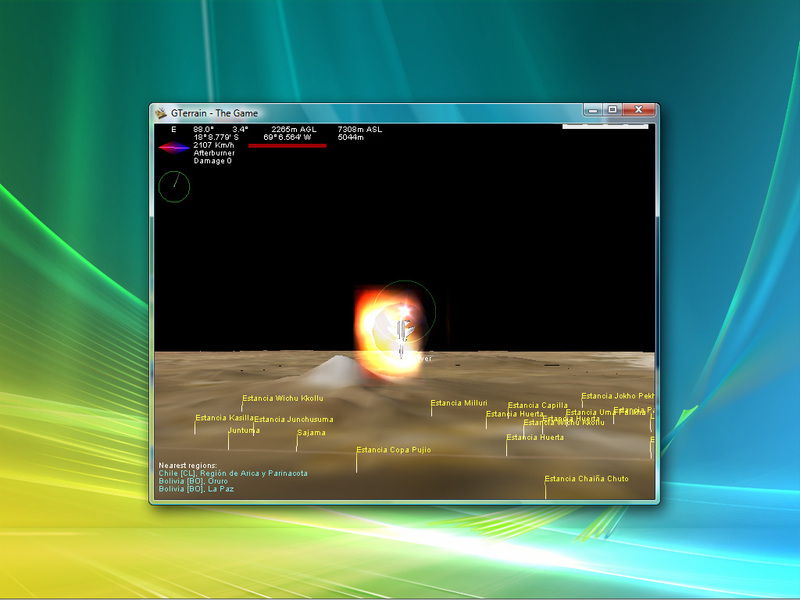 On-screen indicator displaying nearest country and regions. General world map displaying current position. Track log recorder, create and save real-time tracks to KML format. Save current view to Jpeg file. 3D Global Terrain uses digital elevation model (DEM) data collected by NASA's Shuttle Radar Topography Mission (SRTM), and satellite imagery obtained from Blue Marble Next Generation from NASAs Earth Observatory. 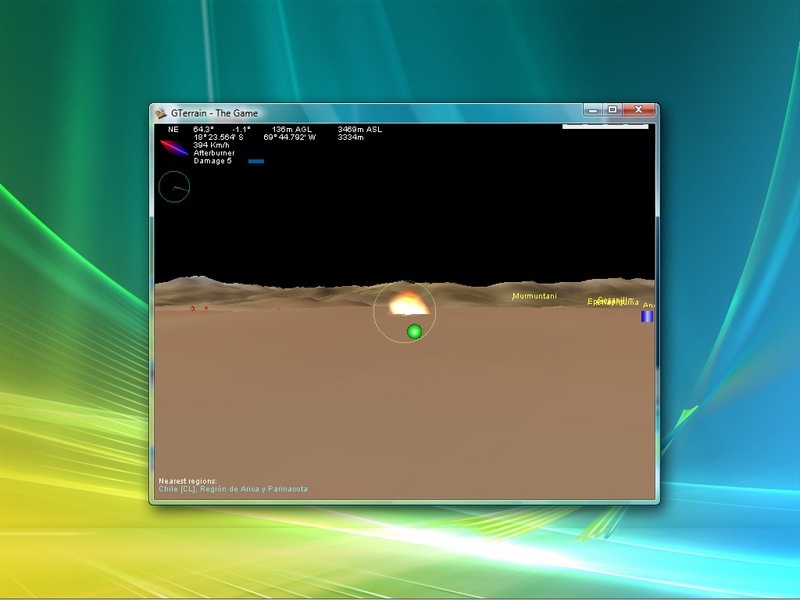 GTerrain - The Game ! 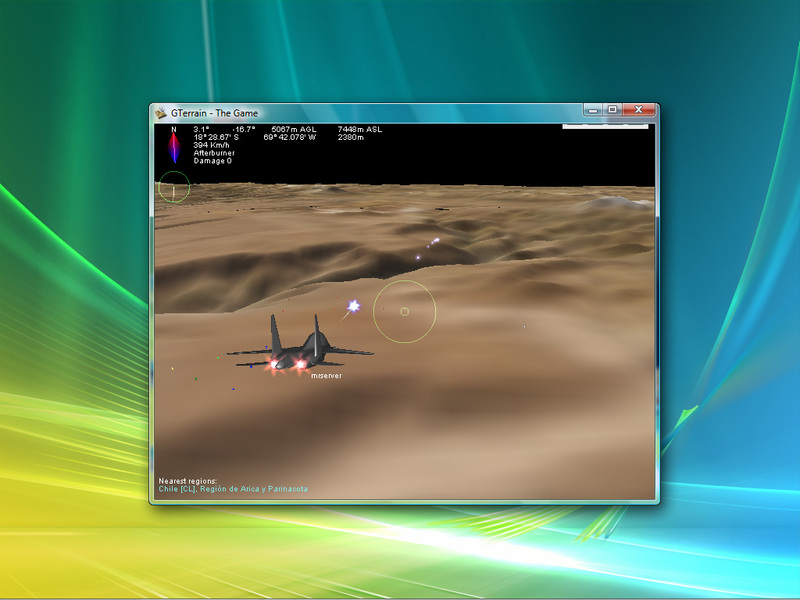 GTerrain - The Game, using 3D Global Terrain engines, this multi-player game take advantage of its real-world characteristics and using LAN network connection (local) will allow you to play and have fun with your friends all interacting together in this virtual world attacking and defending your base and aircrafts. Do you need a specific software?